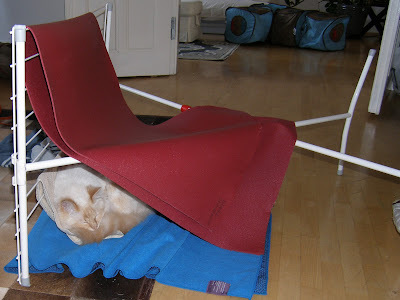 Today I heard a giant crash, and when I went to investigate, I found Lu in a fort of his own making. He'd pulled down the laundry hanger. This'll be the last Cat Tuesday until March 6th due to Dystopian February. He seems quite content...must have been carefully planned and executed chaos! Awwwww, I wouldn't have the heart to be even a little mad if I saw that. he does look rather comfortable in there. Maybe he was just feeling like a bit of camping in the living room.